At last, a practical, how-to book for the overstressed, overworked office worker, middle manager, telecommuter and the increasing numbers of self-employed among us. Fifty hour work weeks with no time for vacations may be the status quo, but Ruth Klein’s book shows us how to organize, prioritize and take back control of our careers and our home life by eliminating stress and finding more hours for us in our stressful work week. I was surprised when reading this book to discover how I had been sabotaging myself with certain behaviors that were making me take longer to get the job done! Bravo, Ruth, Bravo! With love in her heart and a passion for living, author and coach Ruth Klein, brings insightful wisdom to the art of time management and productivity throughtout her book, ‘Time Management Secrets for Working Women:getting organized to get the most out of each day.’ I found Ruth’s book to be a text, a tool, a manual and a guide. It’s all well and good for men and women to perceive that they each have their specific objectives in a twenty-four hour day. However, both can find a unifying thread in Klein’s book. I especially liked how she shows how to make the best of each day, and then feel a sense of fulfillment and accomplishment at it’s end. Using her experiences in both marketing and time management, a contagious positive energy and a keen sense of humor, Klein shares basic techniques, numerous anectdotes and exercises to help you achieve your goals. Her insights are as keen as lightning on a beautiful dawn. Many working women awake to the figurative sound of a starter pistol and race against the clock until they lie down to sleep at night. 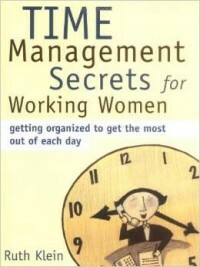 Author Ruth Klein understands the unique challenges that time management presents to working women. The demands of home, family and work always compete for their attention, and they get almost no personal time. She divides women into three “Personal Motivational Lifestyle” categories and explains that a woman will feel unbalanced and unfulfilled if her time investment is out of sync with her lifestyle. She encourages women to nurture a clear understanding of their own personalities so their time use aligns with their values and beliefs. Klein offers many useful, practical timesaving tips, strategies and techniques for the home and workplace.